This recording is from Home In West Virginia, West Virginia Project- Vol. II, Old Homestead LP 177, 1987. From the notes by Ivan M. Tribe, Rio Grande College: The title song is by the twosome of Ellis Hall and Bill Addis. Although they didn't record it until 1952, Hall (1893-1977) was a talented old-time fiddler from an earlier era. A resident of Morgantown, Hall's original fiddle composition has also been recorded by Cy Williams (brother of Doc) and Curly Ray Cline. I have been unable to locate a picture of Ellis Hall, but I do have one of Cy Williams, Quarantine, Sunflower, and Doc Williams taken at WWVA. I am reasonably certain that it was the Cy Williams version that was played on the Lee Moore show. Frail Wildwood Flower is from the same album. 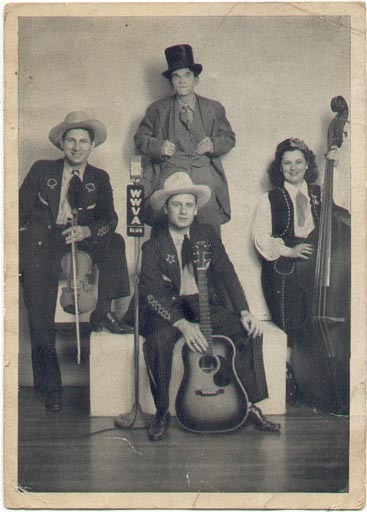 Again, from Ivan Tribe's notes: Miller Wikel (1892-1967) was a musical associate of John McGhee and Frank Welling, playing fiddle on those sides credited to the Red Brush Rowdies and having five sides released under his own name. His arrangement of "Frail Wildwood Flower" was recorded independently of and only a few days after the better-known Carter Family version of the song. Wikel's arrangement, featuring harmonica by John McGhee is likely much closer to the 1860 original by J. D. Webster and Maud Irving. I did not check, but I would think the album would still be available from Old Homestead.